Michael Whitehead is selling the idea of collective software wisdom. The Goal: be quick and cost-effective. The Long Reach Corp. in Manotick provides small businesses around the world with big league software called info@hand. Key to the company’s competitiveness is open source software, programs whose source code is distributed without charge for anyone to use or change, provided it remains freely available. 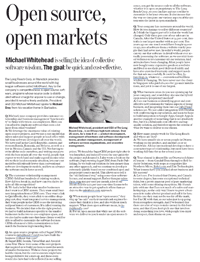 President and CEO Michael Whitehead spoke to Richard Bray from his vacation home in Barbados. Q: Michael, your company provides customer-relationship and business-management ‘functionality’ to firms with two to 200 employees. How can you afford to duplicate software that costs a lot more from other vendors? A: We leverage the enormous value of existing open source projects, and we use a cost model that mixes sales and support people at head office with full-time software developers all over the world. We have staff in the Czech Republic, eastern and western Russia, Romania, and Belarus, as well as a few in Mexico, Canada and the U.S. Not having to write all the code ourselves, and writing our parts with the best minds all over the world, people that expect to work hard and make a good income relative to their local economic situation, lets our cost model be ridiculously lower than conventional software development models, and lets us advance the software much faster as well. Q: The customer-relationship management (CRM) field has hundreds of existing vendors. How did you break in, and how can you thrive despite all this competition? A: We had a belief that what smaller businesses don’t want is a CRM system. They want small business integration from a CRM core. They want a link to QuickBooks, they want a link to an online shopping cart, they want integrated service management, they want people in the CRM to see the invoicing and post history of customers. It’s called running the business. We decided that to be the right product, we had to build in features specific to the smaller businesses in the two-to-200-employee space, and we also had to make sure that these clients would be able to afford to customize the software because CRMs often need a little customization to best match the business implementing them. Q: An open source program called SugarCRM is central to info@hand. Could you have built the business without that core? A: SugarCRM, Joomla, VirtueMart and Asterisk came first. These were some of the core projects that inspired us to build on them to meet the needs of smaller businesses. Without those projects we had the vision, but the cost to execute might have been prohibitive for a start-up, and these costs would also have had to be reflected in our selling prices. We found the SugarCRM project right after it was launched, and indeed I wrote the user guide for the project and donated it. I also wrote a book on the software, Implementing SugarCRM, from Packt Publishing. So we built our solution for less money than any other approach, and we continue to develop it extremely quickly based on our combined open and proprietary source model. This allows us to sell it the “old fashioned way,” using a one-time software licence, and annual support. Rather than pay salesforce.com $130 per user per month, a lot of our clients find the $275 per user one-time license to be an attractive way to get a payback of less than 90 days vs. the salesforce.com approach. Q: When many people hear “open source,” they ring up “no sale” on their mental cash register because they think it is free, and also without much support. What does open software mean, in info@hand’s case? A: For us, open means that while not all the software we deliver to you is under an open source licence, you get the source code to all the software, whether it is open or proprietary to The Long Reach Corp., so you can hire anyone you like to customize it for your own use. It also means that the way we integrate our various aspects of the system uses the latest in open standards. Q: Your company has customers around the world. How do you manage to sell to different countries? A: I think the biggest part of it is that the world has changed. Only three per cent of our sales are in Canada. After the United States at 34 per cent, Australia is our largest market with 10 per cent. Ten years ago no one much would have bought $5,000 or $50,000 of software from a website run by people they had never met. In today’s world, people can try out that software in detail without ever actually possessing the software, as we use trial-hosted websites to let customer try our solution. And attitudes have been changing. Most people have now bought some expensive goods on a website and lived to see their good delivered safely, and have also exercised warranty and support needs for that sale successfully. It could be eBay, futureshop.ca, whatever — conventional business wisdom is changing. We have never met the client in Singapore who paid $80,000 for 350 user installations, and yet it is one of our largest. Q: What business areas do you see opening up for your company, and would they also use the hybrid open source/proprietary method? A: I see our business as identifying great and cost-effective new solutions for various aspects of doing business, and integrating them into our info@hand solution set. We just added integration with Dimdim web conferencing to our solution, and soon we hope to build integration to Google Apps. Google Apps is another example of something that is not absolutely free, but it is a fabulously cost-effective and top-quality solution, and therefore meets the criteria of what we want to deliver to our clients. Q: How many people work for The Long Reach and where are they? A: We have usually six or seven people in Ottawa working on the product, and another 20 or so worldwide. All our international developers have a contractor type of relationship, but most have been working full time for us for several years. Q: Your résumé is almost like an Ottawa tech history lesson — from Gandalf Data through to Bell Security Solutions, with stops at companies like Northern Micro, Rebel.com and Zim Technologies. What lessons have you learned about business and life success? A: Let’s see. I’ve learned that Ottawa, and Canada to some degree, has some exceptional technical folks, but a pretty amateur pool of pure marketing talent, with some shining exceptions. My friends joke with me that I am not much of a sales and marketing type, so the only way I know to grow a business is to make a better product and sell it for less. In this case they may not be too far off the mark, but I’m OK with that, as our sales just keep going from strength to strength. And I’ve learned that there are a lot of ways to make money in this business, and that if you don’t pick one that involves doing something you love, with people you enjoy and respect, then shame on you.